Two-Time Main Event Racing Series winner and Barberton Speedway co-owner Mike Mazzagatti is planning to attend the “Ball” in Pensacola to cap off his 2015 season. The Snowball, that is. Mazzagatti Motorsports and driver Mike Mazzagatti will be attempting to make the 48th annual Snowball Derby at Five Flags Speedway in Pensacola, FL. The famous late model showdown attracts top racers from around the country for a 300 lap showdown every December since 1968. Previous winners include past, present, and future NASCAR stars. Kyle Busch, Darrell Waltrip, Erik Jones, Chase Elliott, and more have hoisted the trademark trophy, topped with a signature snowball. For the 2015 edition scheduled for December 6th, over 60 cars have already registered. Drivers include Ty Majeski, Ross Kenseth, John Hunter Nemechek, Bubba Pollard, and Grant Enfinger. Qualifying on December 4th will lock in the top 30 drivers on time. Drivers that don’t qualify on time will have to race their way in on December 5th. Four drivers will advance from a 50 lap “Last Chance” race to complete the field. Mike Mazzagatti earned two wins in the Main Event Racing Series this year, finishing third in points. His first came at Midvale Speedway near New Philadelphia, OH during the Downtown Ford 100. Mazzagatti dominated the show, leading 63 laps on his way to the checkers. He also powered his #87 FLF Chassis to victory lane at the recently re-opened Spitzer Motor Speedway of Mansfield. Mike completed the season with seven top-five finishes, and was 90 points behind 2015 Main Event Racing Series Champion Jeff Ganus. The team is no stranger to major events. In 2011 and 2012, Mazzagatti competed in the World Series of Racing at New Smyrna Speedway in Florida. The annual event features multiple races over the course of a week, crowning a champion based on total points. 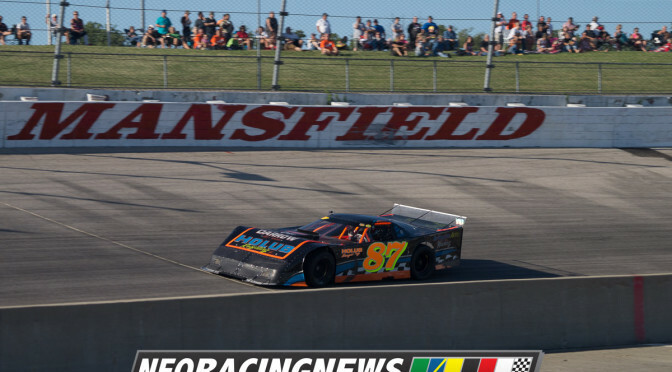 Mike has earned two top-tens in the Pro Late Model division. While Mazzagatti has found success on the track, he has also continued to support the Northeast Ohio racing scene. Mike, with his Brother Pat, purchased Barberton Speedway this summer and returned racing to the paperclip-shaped asphalt track. Barberton Speedway re-opened in September with over 100 cars in the pits and stands filled to capacity. Mazzagatti Motorsports would like to thank their sponsors for making the 2015 season possible: Holub Recycling, Shakers Auto Salvage, Arlington Auto Wrecking, Barberton Speedway, FLF Race Cars, Medina Mountain Motors, and D.W. Signs. Special Thanks from Mazzagatti Motorsports to the following: Lisa, Chloe and Michael Mazzagatti (wife and kids), (Brother) Pat Mazzagatti and Family, All the crews wives and kids for allowing the long hours and travel away from home, Tim Curry (FLF Racecars), and all the supporters and the many many people who make this possible. Top NEO Racing News Videos of 2014!